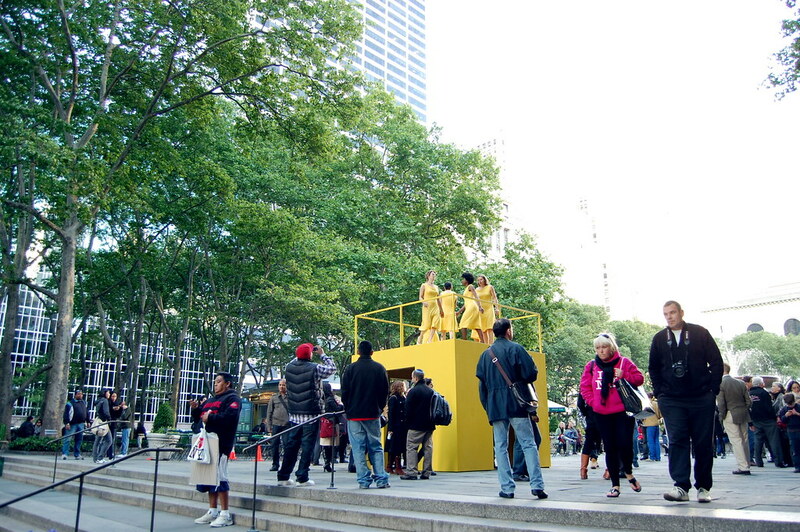 Kate Gilmore's remarkable performance project, Walk the Walk, closes Friday, May 14, after its five-day run in Bryant Park. I'd like to encourage someone to set up a fund to keep the work going forever. They could even set up a Felix Gonzalez-Torres' 1991 Untitled (Go-Go Dancing Platform) nearby! 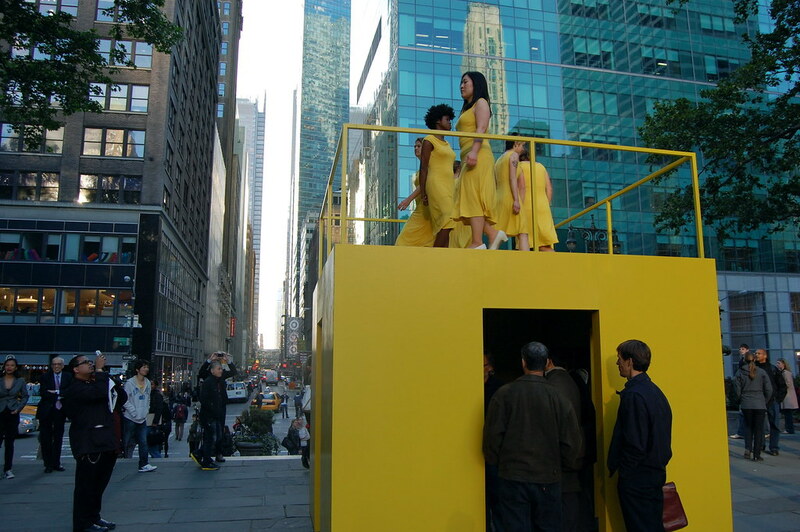 In Gilmore's piece, a total of fourteen women perform for five hours each day, from 8:30 a.m. to 6:30 p.m. Since each women is paid $15/hour, running the project five days a week, for a year, would cost $273,000. That's not a modest sum of money, but it's only slightly more than someone paid for a 1992 Marc Newson table at Phillips de Pury & Company this evening. 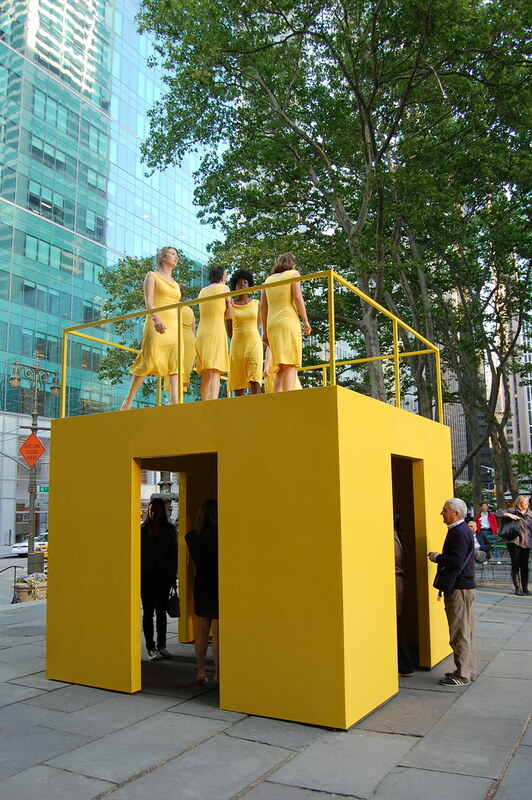 You can see them from a block away: seven women in yellow dresses walking back and forth on top of an eight-foot-tall yellow platform in Manhattan’s Bryant Park. They look straight ahead as they walk, unsmiling, unaware of the people below snapping photos and recording videos on their iPhones. One woman looks annoyed, another frustrated. Some stomp on the ground, while others shuffle and shimmy across the boards. They all look bored.